The Pacifica city council on Monday approved an emergency declaration after storms caused by El Niño battered the city's coastline, leaving behind a sinkhole, a damaged sea wall and a trail of destruction. 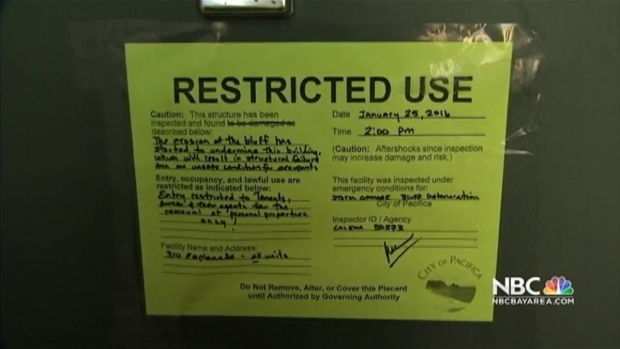 Failing bluffs along the Pacifica shoreline have led city officials to declare a third apartment building uninhabitable Monday. Eroding cliffs along Esplanade Avenue have already led the city to declare apartment buildings at 320 and 330 Esplanade Ave. uninhabitable, and neighboring 310 Esplanade Ave. joined them today, city officials said in a statement. A drone video posted to YouTube shows bluffs falling into the ocean below. The building was "yellow-tagged," meaning residents can go inside to get belongings out but can no longer stay there. The neighboring buildings at 320 and 330 Esplanade will need to be demolished, city officials said. "Recent bluff failures have resulted in unsafe conditions for living space at 310 Esplanade Avenue," city chief building official Mike Cully said in a statement. "Cavities in the bluff are forming to the south, west and north of the building and these critically over-steepened slopes are anticipated to fall back to more stable profiles in the next several days." Significant storm damage in the city over the last several weeks led the city manager to declare a local state of emergency on Friday. The City Council approved an emergency declaration at its meeting Monday night. 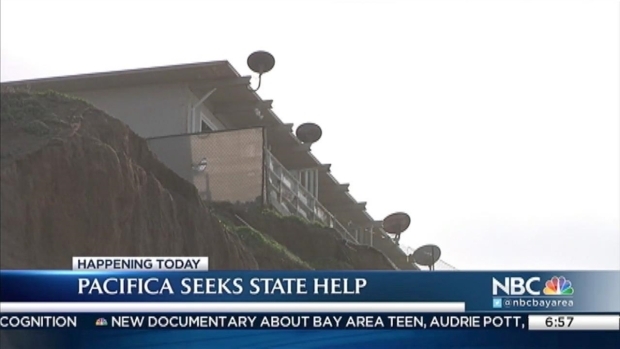 The city has seen damage to the Pacifica Pier, the Milagra Watershed Outfall and the failure of the sea wall along Beach Blvd. near the intersection of Santa Maria Avenue since mid December. The Pacifica city council is expected on Monday to ratify an emergency declaration after storms caused by El Niño battered the city's coastline, leaving behind a sinkhole, a damaged sea wall and a trail of destruction. Bob Redell reports. "We need state and federal assistance to respond to the growing list of failing public infrastructure," City Manager Lorie Tinfow said. Private properties have also been affected, and owners of two properties were notified that their structures were not safe to inhabit. Other areas along the cliff are experiencing significant loss of bluff top as well.